er, anyway, Keebler Coconut Chocolate Chip cookies. Yes, I have a secret stash of these here in the house. Being the only member of the household taller than 4′ 11″, it’s quite easy for me to hide snacks and other things up out of reach and sight of the rest of the family. This afternoon, I stuck a pack of these little round heart-attack makers onto a top shelf. I quickly took the pack back down, ate three cookies, and then returned them to the shelf. Only my son was home at the time, and he was in another room. An hour later, I brazenly helped myself to one with my daughter and wife in the room. My wife was oblivious, but my daughter caught me… or did she? “You didn’t see anything…” I told her, with crumbs spitting from my lips as I said the words. I think she believed me, although she did ask me how many cookies SHE could eat right after. I gave her two E.L. Fudge cookies from the cookie jar and we silently agreed to never speak of that moment again. And now, with my son’s visiting god-parents up in the guest room, I’ve grabbed 3, then 4 more, and finally another 3 cookies from my secret stash. I feel guilty, but the cookies are so good. And no one else in my family likes coconut flavored anything anyway. Now, I want you to forget you ever read this… unless, of course, I die in my sleep from a heart attack, in which case you should suspect my stash of cookies had something to do with it. And, make sure the surviving cookies find a good home. Last night ESPN ran the story that Brett Favre was staying retired. On the 11 PM EST edition of Sports Center, they ran a graphic showing that over the last two years Favre had thrown 13 interceptions when his team was trailing by 7 or fewer points in the fourth quarter, Ben Roethlisberger (boo!) had thrown 7, and no other quarterback had thrown more than 6. (Sorry, I can’t find a video or screen cap of this, but don’t worry – it’s not the graph I’m blogging about). I’m not a Favre fan, but I felt that was an obnoxiously misleading stat. Favre threw 13 interceptions when his team was trailing by 7 points or less in the fourth quarter and Roethlisberger threw 7? Well, how many times was each in that situation? Maybe Favre’s team were in that situation 20 times over two years, and Roethlisberger’s teams only 9. Maybe a quarterback in the 6 or fewer group only was in that situation a handful of times and threw multiple interceptions? Who has the ball? For how long? And what abou those desperation, last second, “Hail Mary” bombs thrown as time expires – should they really be counted? As I said, I’m not a Favre apologist, but that was clearly a statistic lacking complete context. So, I thought I might write about it, and in the process of searching for that graphic, I found this one. Now, I found it via Google’s Image Search, and didn’t really look at the article that sparked it. I (foolishly… I’m smart enough to know better) didn’t read the article at all, actually, I just went by the key and the heading and kind of glanced at the graph. Almost immediately, I felt like something wasn’t right. 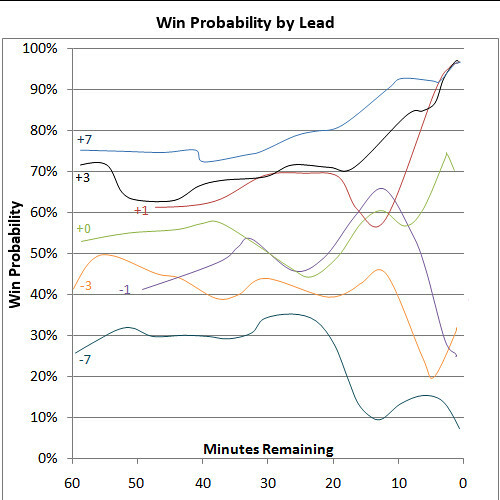 I noticed that the +3 and +7 score differential lines (indicating that the team was ahead by 3 or 7 points at that instant) spiked toward 100% chance of winning as time expired in the game. Makes sense… and even the +1 line went toward 100% as time expired. The -7 score differential line headed down toward a 0% chance of winning. However, the -3 line behaved unexpectedly -it didn’t drop toward zero percent as time expired, it went to about 20% with a local minimum at about the 6 minute mark. Strange. Upon closer inspection, I started to question why the lines weren’t mirror images (with the line of symmetry at 50%). You would think that if the team leading by 7 points with 30 minutes left in the game will win the game 75% of the time, then the team losing by 7 points at that instant only wins 25% of the time. But that’s not what this graph indicated. I was puzzled and somewhat irked as I consider myself kind of an expert at mathematics and statistics. I contemplated it for a bit, but couldn’t really rationalize it. In fact, part of me wondered why they even showed the -1, -3, and -7 lines… they shouldn’t be necessary as each of their values should have been the value which adds to the +1, +3, or +7 value to make 100. Ah, but let’s get back to the thing I didn’t do that I really should have… read the actual article. So, that changes everything, and I feel foolish. I still feel like the graph’s a bit wonky and subject to misinterpretation, but I’m excited to explore the Advanced NFL Stats site (as I do LOVE that sort of thing) and I’m proud to have figured out my mistake (go me!). On Saturday, July 11th, independent filmmaker Joe DeFelice will show his documentary – “The Deerfield: A Working River”. The film is a study of the social and natural history of the region and the technological development along the Deerfield River watershed. Interspersed with interviews of local experts, old photographs, guitar music and voiceover narratives, the film becomes an intriguing history lesson. DeFelice wants people to learn about the river and realize the need to protect it. He has produced 3 other films about rivers and lives in southern Vermont. The presentation will start at 6:30 in the Zoar Outdoor Pavilion. These programs are free and open to the public. A simple summer barbecue starts at 5:30 pm for $8.50 per person and film show begins at 6:30 pm at the Zoar Outdoor Pavilion. For more information, contact Zoar Outdoor at 800-532-7483 or www.zoaroutdoor.com. Joe DeFelice has always loved rivers. DeFelice, 39, grew to become a filmmaker and has made three films about rivers. His most recent, The Deerfield: A Working river, will have its world premiere at Pothole Pictures on Friday, June 12 to kick off the RiverFest celebration here. His first film was about the Yellowstone River, a tributary of the Missouri River, which runs through Montana and Wyoming. One of the factors which interested DeFelice about the Deerfield was how different it was from the Yellowstone. “The Yellowstone is the longest free-flowing river in the continental U.S. and the Deerfield is the polar opposite,” he says. “It’s one of the hardest working rivers in the U.S.” What exactly does he mean by a “working river?” “’Working’ means ‘being worked’ and that means by dams —using its power for harnessing energy, “ he explains. There were other qualities about the Deerfield that made it worthy of being the subject of its own film. “I really appreciated it for the variety I saw in the river,” says DeFelice. “The headwaters begin in basically wilderness areas and then you have the incredibly developed portion down through Massachusetts, and parts of Vermont, too. And yet, even though it’s tamed and it’s not as wild as the Yellowstone, it still has its beauty showing through. All through this process I always saw the beautiful side of the river and came to realize that it’s pretty darned healthy. Obviously the dams fragment the river, but even with that, there are lots of fish and people are trying to manage it well. The people I’ve interviewed say it’s one of the healthiest rivers in the state. To make his film about the Deerfield, DeFelice employed historical photos, documents and interviews with people who live and work along the river. He describes the film as “basically a portrait of the river. “ He goes on to say that his film about the Yellowstone concentrated mostly on environmental aspects, but he wanted to add more human elements into this project. “I want the audience to learn about the river — all aspects of it including the history — human history, in-depth natural history,” he says. The Deerfield: A Working River is about 75 minutes long and is in turns poetic, instructional, inspiring and an intriguing lesson in history. It begins with a montage of still and action shots taken all along the expanse of the river accompanied by a voiceover narration and soothing acoustic guitar music. It progresses to a series of narrative sequences by folks involved in some way with the river, many of whom are familiar to West County residents, including Charlie Crosier, a historian from Colrain, Charlemont archaeologist Aaron Miller and Shelburne Falls Trolley Museum representatives Alden Dryer and Polly Bartlett. All throughout the film are fascinating, old black and white photographs of familiar and not-so-familiar locations and some stunning modern cinematography of the river, its banks, watershed, wildlife, buildings, skies and neighbors. I am very proud of my friend, and I wish I was there today to stand with him at this special time. But, I’m quite confident this wont be the last time he’s showing one of his films. Congratulations, Joe, on a terrific piece of work. I’m so proud of my little boy. Today, he went to his first (and only?) summer hockey practice. He didn’t know anyone there. He’s hardly an all-star player. It was hot. I hope that when I told him today (and every day) how proud I am of him – he felt only joy and never worries about letting me or anyone else down, ’cause that’s an awful feeling I would never wish on anyone. For some reason, this little boy thinks I’m the greatest person in the world. Every time he tells me so, I feel a mix of joy, agony, and anxiety – joy that he loves me so much, agony knowing that the real me falls far short of his perceptions, and anxiety about the day he figures that all out. My son, though, he’s the real deal: a good person with heart, compassion, and empathy for anyone and everyone. And I’m very proud of who he is and what he does – today, and every day. You are currently browsing the That other blog blog archives for July, 2009.